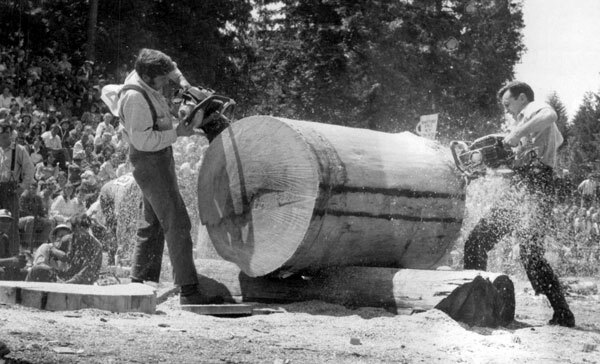 This is a contest between loggers making cuts off of ends of logs using chain saws. Most of the men you see in this contest make their living with the same chain saws they’ll be using here. They are the men that fell the trees and buck them into log lengths. A good faller will fall the trees so that they are easy to buck; so that the tree doesn’t break up, and so they are as safe as possible. What some of these men can do with trees is magic. The bucker must be able to cut that tree so that the logs scale as much as possible; so that he gets the best grade in the trees and so he doesn’t either split the log or get his chain saw hung up.